Pierre Coubertin was a long-standing opponent of separate winter Games. But it was Norway and Sweden who fought hardest against them. They were afraid that winter Games would reduce the status of their own events. For Norway, the Chamonix Games were a great sporting success. Thorleif Haug was the skiing champion with gold medals in the 18 km, 50 km and Nordic combined. 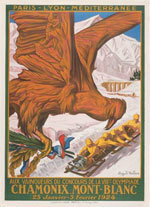 The programme had only 14 events: 4 in Nordic skiing, 4 distances and a combined in skating, 3 figure skating events, plus ice hockey and 4-man bobsleigh.